Description: Pirate captain with a hook. Other Info: Captain of the pirate dogs that took over the Pirate Seas. He kidnapped Jess LeGrand as he made his escape. After being defeated he and his pirates took control of the Cutthroat Carnival. The Skylanders came by searching for a way to fix the Dread-Yacht and were challenged by each of the pirates to a game of Skystones. 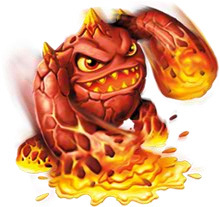 After being beaten Captain Dreadbeard joined the Skylanders on the Dread-Yacht and helped them practice Skystones. Quote: "Yo ho! Ye want me to leave, eh?"